I am smitten with Shirley Jackson and her House Of Fun from ‘The Haunting Of Hill House.” Her house had stood alone for 80 years, designed by some eccentric deliberately to confuse and mislead, a house bad to the core. It is a house where doors shut themselves and things hammer and scrabble at doors, and the place gets inside your mind: it has inspired the great writers about the paranormal today,including Stephen King. When I walked into the court of Royal Holloway College, a late 19th century copy of a castle in the Loire Valley, I had an uncanny sense of deja lu. In 1959, Hill House was 80 years old, and had thus been built in 1879. 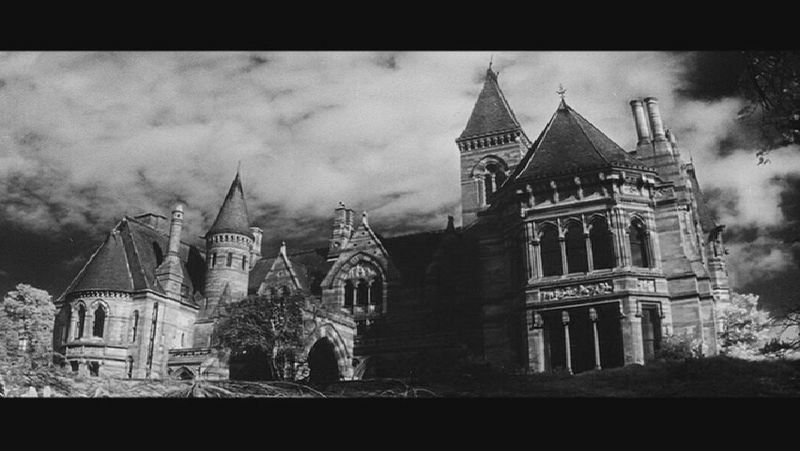 A film was made of the book , The Haunting, in 1963. In the end he listened to his wife: create a college entirely for women, she said. And he commissioned Royal Holloway College, nestling in leafy Egham, in Surrey. It was built by Yorkshireman William Henry Crossland, who must have loved it very much, for in latter years he set up home with his mistress, the actress Eliza Ruth Hatt, and their son, in a bungalow in the grounds of the college. It was opened by Queen Victoria in 1886. Maddie likes the gothic, and on Saturday afternoons, to relieve the stress of study, we potter out to take in the outrageous, the daring, the theatrical. And Royal Holloway is all that, and more. It does not have the lowering threat of Hill House. It is a place good to the core. Students see to that; though the great quadrangle with Queen Victoria was deserted this Saturday afternoon, a random student wandered across from one door to another in a bunny onesie. Royal Holloway has its feet anchored firmly on the ground. But it is outrageous. Flamboyant beyond belief, florid to the point of the bizarre, and on a Saturday completely deserted. A visit on a crystal clear, ice-cold Saturday afternoon in January is the most peculiar experience. Like walking around a great deserted city, the scene of a lost civilisation. The chapel is a crazed, dazzling montage of the elaborate. A sharp intake of breath is compulsory, at least on entrance and usually several times touring round. The pattern, the gilt, the rich Morrissian colour: it all takes Lavish to a new level. Most of the great thinkers, writers and composers of time are up there on the walls somewhere. Victoria presides over one great quadrangle, and Thomas and his wife gaze indulgently down over the other, each in gleaming white marble. And so: if you are passing Virginia Water and Egham on the A30, motoring up to London for some soiree or other: pull over at Royal Holloway, and get out the picnic hamper. Providing you are not the driver, pour a glass of champers, and when sufficiently tipsy, wander capriciously around Thomas Holloway’s breathtaking House Of Fun. Posted in UncategorizedTagged architecture, gothic, Hill House, history, Queen Victoria, Royal Holloway College, Shirley Jackson, travel. places to visit. EnglandBookmark the permalink. I so want to visit that place. Thank you for sharing and inspiring me to put it on my list. Lisa, it’s a fabulous place to wander, and there is no charge for looking around. The art gallery is open on Wednesdays I believe – that’s my next project! It looks fantastic, Lou. Must put it on my list when we next visit the states! I never read the book, but I certainly remember the 1963 version of “The Haunting.” I just put it on my Netflix list to watch it again. Gorgeous building, thanks for the great pics. Pleasure, RMW. I love the film, but the book just blew me away. The writing is simply sublime. I remember going for an interview there for History, over 40 years ago. I thought it was an amazing place and it ended up as my insurance offer -I would have gone there if I hadn’t got the grades for Exeter. Hi Jan! Exeter has its charms: the cathedral is peerless. I, too, went for an interview for a music and drama degree there. A lovely place, far from the madding crowd. I’ve read the book and seen the movie . . . both grand entertainment. Thanks for the photo tour of The House of FUN ~ what a great place to wander with your daughter. WOW. If I hadn’t just read different, I would have guessed the place was a palace. Wow is pretty much all you can say!